If you have noticed a sudden change within your browser's default settings, it might be an indication that a program known as Indiasearch-results.com could be active on your personal computer. If that is the case already, make sure to execute its complete removal as soon as possible. We advise you to do so because the invasive application happens to be another invasive search engine that acts in an intrusive manner. During the analysis, our research team has discovered that due to changes triggered by this dubious program, surfing the web will become a much more annoying and frustrating experience. Unfortunately, that is not all; as it turns out this search engine could be quite dangerous since it might be the main reason your operating system could be subjected to suspicious and even malicious web content. To delete Indiasearch-results.com once and for all, make sure to use the detailed instructions that we provide below. As mentioned earlier, the first indication that Indiasearch-results.com is up and fully running on your personal computer is a sudden change of your browser's default settings. To be precise, this invasive program initiates the alteration of your default search engine. 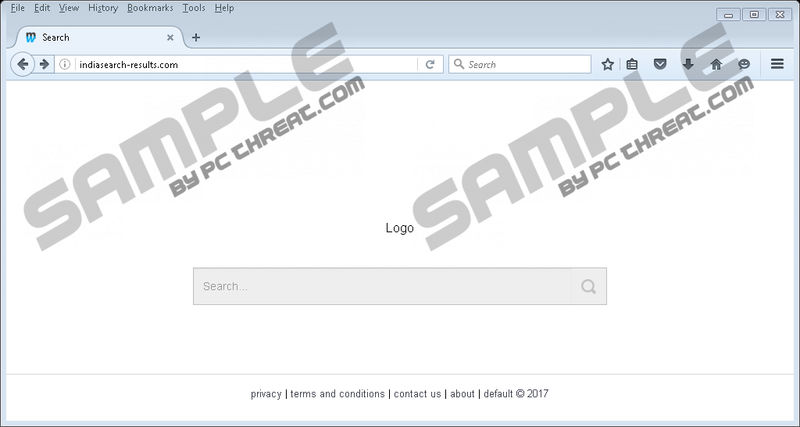 That happens due to a suspicious third-party browser extension that this undesirable program installs as soon as it gains access to your operating system. The devious browser plug-in also maintains the unwanted change. One of the most annoying things in regards to all these modifications is the fact that you are not warned or asked to authorize them. After the invasive alteration, surfing the web the way you are used to will be impossible. That is so because the devious application will force you to use a suspicious third-party search engine at all times instead of the one you might prefer. What makes matters worse is that the newly appointed search engine acts in a questionable way, to put it lightly. During the analysis, our researchers have discovered that in quite a few cases this search provider might present you with sponsored results instead of useful ones; in some cases, the result might have no relation whatsoever to your original query, which is bothersome. It should be quite evident that there are no good reasons to keep this suspicious program active on your PC. Your best bet to regain your browser's default functionality is by executing a complete removal of Indiasearch-results.com at the very same time that it is discovered running on your PC. To do that quickly and easily, make sure to follow the removal instructions below. Unfortunately, there is something much more alarming about Indiasearch-results.com that you might think. During the analysis, our malware experts have discovered that using the newly assigned search engine could prove to be not only annoying but dangerous as well. As it turns out some of its presented results could host redirect links that could lead you to suspicious and even malicious web pages. For example, there is a chance that you could end up on fake online shops. Such devious stores are crafted by cyber criminals for a single reason - to steal your credit card data. You could also end up on web pages crafted by malware developers that could run an arbitrary code execution exploit. If you ever enter such a site, that could be just enough to infect your operating system with some unknown malware. That is so because the mentioned exploit can initiate a remote installation of some dubious program without a user's consent. While results hosting suspicious redirect links do not occur often, the possibility to come across one remains. Do not take any chances with Indiasearch-results.com and conduct its complete removal at the very same moment that it is found active on your PC. It is critical to delete Indiasearch-results.com if you consider yourself to be a security-conscious user. Keep in mind that only a complete removal of this invasive application will allow you to regain your web browser's default settings. If after manual removal, you are still bothered by the undesirable change, it might be an indication that traces of Indiasearch-results.com are still active on your PC. In other situations, due to leftovers, the devious program could be restored silently. If you wish to be sure that every single bit of Indiasearch-results.com has been removed from your PC, make sure to double-check your operating system for any suspicious traces. Otherwise, you can scan your entire operating system with a reliable antimalware tool since it can detect and delete anything associated with Indiasearch-results.com automatically. Click the Remove button next to the dubious extension. Click the Chrome Menu button and select More tools. Click the Recycle bin icon next to the unwanted extension and select Remove. Select the unwanted extension and click the Remove option. Select Troubleshooting Information and lick Refresh Firefox. Click Advanced and then select Reset. Quick & tested solution for Indiasearch-results.com removal.